Who is TMS Suitable For? What to Expect from Stimulation Therapy? What Will Treatment Cost Me? So what is rTMS and how does it work? Whenever we talk about medical intervention, patients become understandably nervous. This is likely to be the case when the patients suffer with anxiety and are considering a new type of depression treatment, like rTMS. rTMS stands for repetitive transcranial magnetic stimulation. The therapy is becoming an increasingly popular form of depression treatment in Australia. In Australia, rTMS has been approved by the Therapeutic Goods Association to treat depression where medication trials have failed. It is a non-invasive treatment that generates magnetic fields to ignite neurones in the brain. The treatment is particularly effective for patients who have experienced treatment resistant depression. It is not exactly certain how the technology helps people with depression, but there is a considerable amount of research proving its effectiveness. You can click here to read our collection of rTMS research. The technology is welcomed by people who have been battling depression for many years. In a number of situations, the medications often prescribed for depression have caused a range of significant side-effects. TMS on the other hand has relatively few side effects and is generally well tolerated. During rTMS treatment an electro-magnetic coil is placed against the patient’s scalp. The coil directs pulses to the frontal cortex of the brain. It is a relatively painless process, as the magnetic pulses travel to the part of the brain that controls mood and depression. During the course of the treatment, the team at Sydney TMS monitors the progress and adjusts the settings as required. A caring member of the team is there providing treatment every step of the way. Patients are awake during treatment and can talk to the technician throughout the procedure. rTMS is certainly providing patients with an alternative treatment option for depression. It fills the treatment gap between medication and ECT (electroconvulsive therapy). TMS also provides hope to those who desperately want to improve their overall mood and lift depression symptoms. We would love the opportunity to work with your current treating mental health professionals to achieve the best result for your mental health. To find out more about TMS please visit our website or contact us today 1300 177 144. Our offices are located in Bondi, St Leonards and Castle Hill. RUOK? and what it’s all about. Treatment for depression. Preventative and reactive approaches. Can TMS therapy help me? How to support someone when they’re going through TMS therapy? 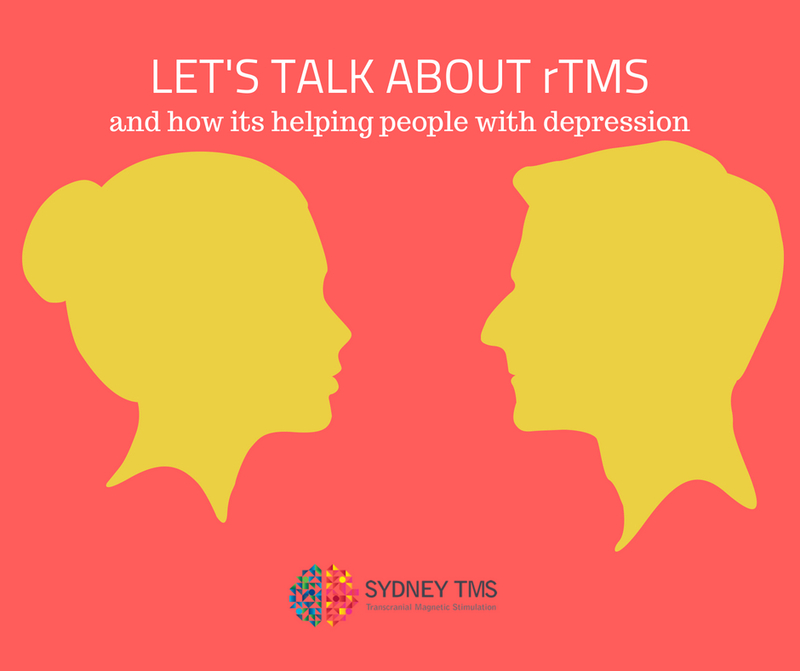 What makes Sydney TMS different to other anti-depressant treatments? Is TMS the right treatment for my depression? What to expect from TMS Treatment? What Will TMS Treatment Cost Me?